This study aims to find out: 1) whether or not the leadership quality of the alumni of MMP FKIP UKSW is affected by creativity and curriculum; and 2) the determinants of the alumni's leadership level: creativity or curriculum factor. The participants of this research are those who have graduated (alumni) from MMP FKIP UKSW Salatiga, working in Temangung regency. There were as many as 35 alumni in 2014/2015 selected to join this research. The data was collected using self-rating scale consisting of 32 items that have been tested valid and reliable, then it was reduced to 3 variables. The analysis process was undertaken by using SPSS 24 assisted analysis technique. The result of this research showed that curriculum have nothing to do with the level of leadership. Meanwhile, alumni’s leadership level is significantly determined by the creativity. This finding is very important for the aspect of course quality improvement management that supposed to be conducted by professional lecturers. MMP FKIP UKSW refines its learning activities on creativity-based lectures which will bring positive influence on leadership level. Arikunto, Suharsimi. 2012. Evaluasi Program Pendidikan. http://anan-nur.blogspot.co.id/2012/01/evaluasi-program-pendidikan-prof-dr.html (diakses tanggal: 20 November 2017). Bonvillian, G., & Nowlin, W. (1995). Integrating principles of TQM into teaching and learning. Academic Initiatives in Total Quality for Higher Education por Harry V. Roberts, ASQC Quality Press, Milwaukee, Wisconsin, 95-116. Dyer, J., Gregersen, H., & Christensen, C. M. 2011. The innovator's DNA: Mastering the five skills of disruptive innovators. Harvard Business Press. Entwistle, N. and Ramsden. 1987. Understanding Student Learning. London: CroonHelm. Frost, P.J. 2003. Toxic emotion at work: How compassionate managers handle pain and conflict. Boston: Harvard Business School Press. Goleman, D., R. Boyatzis, & McKee. 2003 The New Leaders Transforming, the Art of Leadership into The Science of Result. London: Little Brown. Handoyo, S. (2011). Pengukuran servant leadership sebagai alternatif kepemimpinan di institusi pendidikan tinggi pada masa perubahan organisasi. Makara Hubs-Asia, 8(3). Kolb, A. Y., & Kolb, D. A. 2009. Experiential learning theory: A dynamic, holistic approach to management learning, education and development. The SAGE handbook of management learning, education and development, 42-68. Lusiana, N., Andriyani, R., & Megasari, M. (2015). Buku ajar metodologi penelitian kebidanan. Yogyakarta: Depublish. Robbins, Stephen P., 1996. Organizational Behavior : Concept Controversies Applications. Sevent Edition, Diterjemahkan Oleh Dr. Hadyana Pujaatmaka, Perilaku Organisasi : Konsep kontroversi Aplikasi, Jakarta: PT. Prenhallindo. Rohman, A., & Lamsuri, M. 2009. Memahami pendidikan & ilmu pendidikan, Yogyakarta: LaksBang Mediatama bekerja sama dengan Kantor Advokat "Hufron & Hans Simaela". Sudiro. Maret 2010. 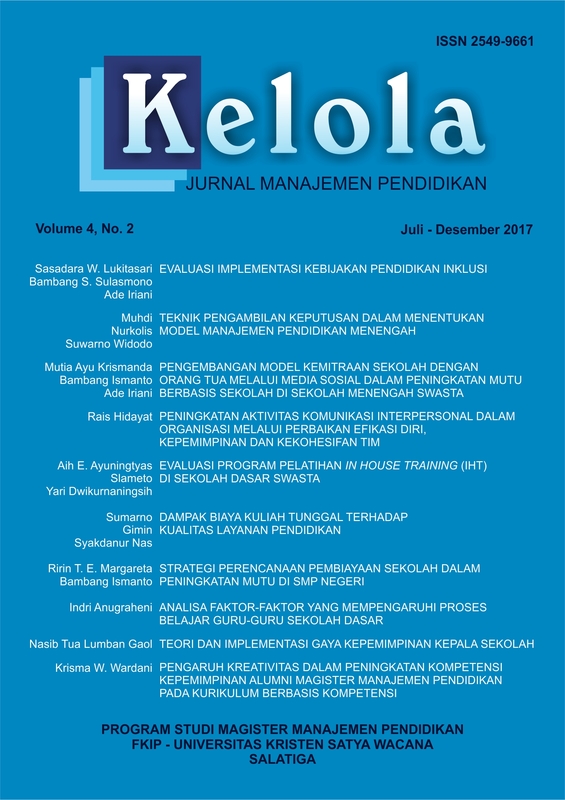 (Online) (https://rumahpendidikan.files.wordpress.com//makalah-profesionalisme-dosen.pdf , diakses 27 Pebruari 2015). Sujiono, Y. N., & Sujiono, B. (2010). Bermain Kreatif Berbasis Kecerdasan Jamak. Jakarta: Indeks. Untayana, J. R., & Harta, I. (2016). Pengembangan perangkat pembelajaran limit berbasis pendekatan saintifik berorientasi prestasi belajar dan kemampuan komunikasi matematika. Jurnal Riset Pendidikan Matematika, 3(1), 45-54. Wibowo, B., Machfudz, M., & Sunaryo, H. (2015). Pengaruh Karakteristik Pekerjaan, Motivasi Dan Kepemimpinan Terhadap Kinerja Pegawai di Kantor Imigrasi Kelas I Malang. Warta Ekonomi, 4(2). Yukl, G. A. 2010. Leadership in organizations. Seventeenth Edition. Upper Saddler River, New Jersey: Pearson Education India.